Runtime: 3 hr. 20 mins. 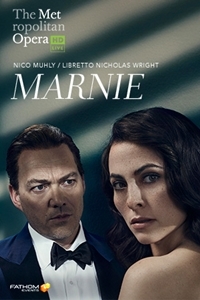 An encore performance of Nico Muhly's Marnie will be shown in select cinemas nationwide on Wednesday, November 14. Composer Nico Muhly unveils his second new opera for the Met with this gripping reimagining of Winston Graham's novel, set in the 1950s, about a beautiful, mysterious young woman who assumes multiple identities. Director Michael Mayer and his creative team have devised a fast-moving, cinematic world for this exhilarating story of denial and deceit, which also inspired a film by Alfred Hitchcock. Mezzo-soprano Isabel Leonard sings the enigmatic Marnie, and baritone Christopher Maltman is the man who pursues her-with disastrous results. Robert Spano conducts.